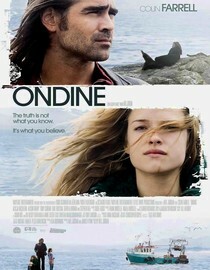 Ondine (U.S. 2010). The latest film from Neil Jordan is in theaters and on demand. Colin Farrell, continuing his string of strong performances, plays a down-at-the-heel Irish fisherman who catches a mysterious woman in his net. Farrell’s young daughter suspects that she’s a selkie, an outlandish explanation that Farrell himself is inclined to believe even in the face of evidence suggesting a more earthbound – and dangerous – origin. It’s a lovely, delicate film, essentially a fable, helped enormously by Christopher Doyle’s cinematography that captures an Ireland where sea, sky and sod are at times indistinguishable. The Special Relationship (2010). Peter Morgan and Michael Sheen’s third collaboration about Tony Blair, now on HBO, focuses on the PM’s tricky relationship with Bill and Hillary Clinton (Dennis Quaid and Hope Davis), especially post-Lewinsky. The familiarity of the material makes it the least successful of the trio, but it deepens their joint portrait of Blair as a glib leader with sharp instincts who is all too easily starstruck, at times even by himself. I Knew It Was You: Rediscovering John Cazale (2009). Cazale only appeared in five movies before his death at age 42, but every performance still haunts. And all five films – The Godfather, The Conversation, The Godfather: Part II, Dog Day Afternoon and The Deer Hunter – were nominated for Best Picture. Director Richard Shepard (The Matador) has assembled a lively tribute featuring those who worked with and loved the actor (Al Pacino, Sidney Lumet, Meryl Streep) and those who were inspired by him, like a very astute Sam Rockwell. My favorite observation comes from one of Cazale’s friends, who says that the secret to his technique was to find what caused his character pain and build the performance around that. On HBO.